When reformers talk about our healthcare system, they repeatedly cite the number of uninsured Americans as one of the primary problems in need of a solution. In 2006, the Census Bureau estimates of the uninsured reached 47 million, representing approximately 16 percent of the population. While this number has dominated nearly all healthcare policy debates, it unfortunately remains a relatively coarse measurement and provides little substantive information about the uninsured that can be used to craft effective policy solutions. For example, it is often assumed—without any quantitative evidence—that nearly all of these uninsured individuals lack coverage because they are unable to afford it. Furthermore, the lack of health insurance is often equated with a lack of healthcare, despite the fact that individuals without coverage often receive medical services from a wide variety of sources within the healthcare system. As the country moves closer to a serious debate over healthcare reform, whether these assumptions reflect reality will make a significant difference to the policy outcome. Unless we have a better understanding of the characteristics of the uninsured population, the solutions proposed may, in practice, be poorly targeted and ultimately ineffective. This study attempts to increase knowledge in the field of health policy by examining some of the characteristics of those without health insurance. The authors calculate the percentage of uninsured Americans that could likely afford health coverage. Drs. June and David O’Neill of the Baruch College, City University of New York use data from a number of surveys to determine what percentage of the nearly 47 million uninsured Americans lack health insurance because they are likely unable to afford it—classifying them as “involuntarily” uninsured. They find that at least 43 percent of Americans in the 18–64 year-old age group have incomes at or above 2.5 times the poverty line, indicating they likely have the means to obtain healthcare coverage and thus may be classified as “voluntarily” uninsured. To further examine this classification, the authors then compare the characteristics of the voluntarily and involuntarily uninsured with the characteristics of the privately insured population. The authors find the most striking differences when comparing the involuntarily uninsured to the privately insured. For example, roughly one-third of the involuntarily uninsured are high school dropouts, compared to approximately 7 percent of the privately insured population. A disproportionately large percentage of the involuntarily uninsured are young, a third are immigrants, close to half are single without children, and close to 40 percent did not work during the year. Indeed, many of these demographic differences—which are not necessarily shared by the voluntarily uninsured—may contribute to the differences in health coverage. A productive conversation about health policy must also separate the concept of a lack of health coverage from a lack of healthcare. Individuals without adequate health insurance still receive medical care from a variety of sources. The authors look at the utilization of certain services— in particular, screening for cancer—and find that the uninsured may indeed receive less care than those who are privately insured. However, when compared with screening rates for Canadians (who largely receive healthcare coverage through a nationalized, single-payer system), the uninsured in the United States actually compare favorably. To further determine whether lack of coverage means lack of service, the authors also report estimates of the dollar amounts of healthcare resources obtained by the uninsured in total. The estimates indicate that on a per-capita basis, the uninsured receive about 40 percent of the amount of health resources received by those with insurance. Interestingly, the involuntarily uninsured receive more than half of the total and the voluntarily uninsured less, because “safety net” providers generally distribute resources to lower income people. 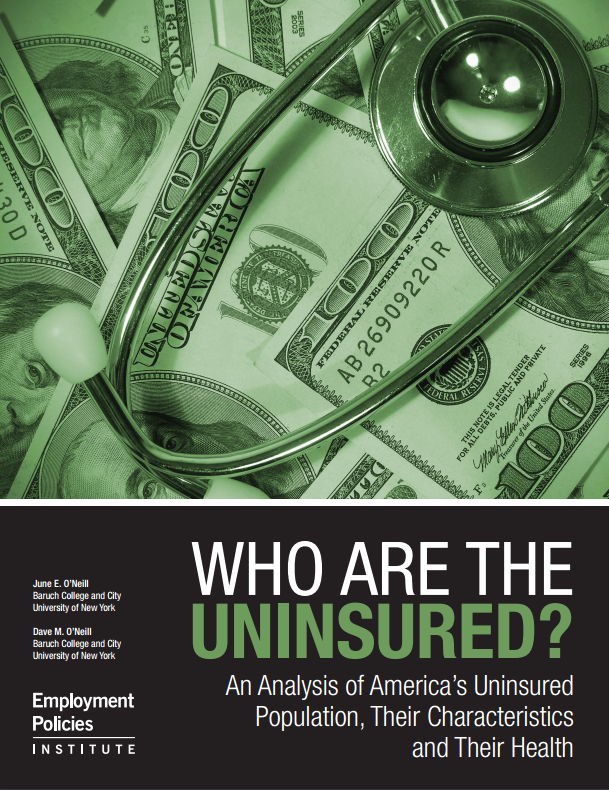 After determining the characteristics of the uninsured and discovering that being uninsured does not necessarily mean an individual has no access to health services, the authors turn to the question of mortality. A lack of care is particularly troubling if it leads to differences in mortality based on insurance status. Using data from the Health and Retirement Survey, the authors estimate differences in mortality rates for individuals based on whether they are privately insured, voluntarily uninsured, or involuntarily uninsured. Overall, they find that a lack of health insurance is not likely to be the major factor causing higher mortality rates among the uninsured. The uninsured—particularly the involuntarily uninsured— have multiple disadvantages that are associated with poor health. Designing effective health policy requires full information about the composition of the uninsured, including an assessment about whether long-held assumptions are supported by evidence. This includes understanding the factors contributing to a lack of insurance and information about the true consequences of that lack of coverage, particularly the effect on the uninsured population’s utilization of health services and the effect on mortality. This study shows that a large fraction of the uninsured could likely afford health coverage. In addition, it shows that the involuntarily uninsured are demonstrably different from the privately insured. Finally, the authors show that while the uninsured use fewer health services, they still receive a large amount of care, and there is little discernable difference in mortality based on insurance status. As we begin to engage in this important debate, priority should be placed on policy solutions that have the best chance of being effective. Policies that focus, at least at first, on providing coverage and services to the involuntarily uninsured—the truly at-risk—will accomplish the most and take us much further in improving the overall health of the nation.